To say the least I am offended, but not by God, or Jesus, or the words of Scripture, but rather a religious monster created by an aberrant and heretical brand of the Christian faith that is being sold as absolute truth by Christian Fundamentalist extremists in our country. Levi was right, but at the same time he was wrong. Sometimes these monsters are the same people that end up being the functionaries who are ready to believe and act without asking questions. Sadly, there are many leaders of the political-religious movement loosely defined as the “Religious Right” in the United States who preach a “gospel” of hate and intolerance that demonizes anyone that dares to interfere with their message. Sadly this doesn’t just extend to their politics, but also to the basics of the Christian life of which many of these leaders seem ignorant. Personally I believe that the virtue of living a good Christian life might be equated with living a good life regardless of one’s religious or secular beliefs. The call to “love God and to love your neighbor” is universal. It has been my experience that even people that chose not to believe in God, subscribe to the principle of loving or at least respecting one’s neighbor. has hardened my resolve as a Christian to oppose these American “Christian” versions of the Taliban, Al Qaeda or the Islamic State at every turn. I have to, because most people, including many moderate and progressive Christians look the other way and do not confront these monsters. People don’t want to believe that good religious people can harbor thoughts of evil, demean, or actually harm others. But all too often that is the case and we have to call them what they are; not saints, but monsters who use their “faith” to demean, dehumanize and destroy anyone that does not agree with them, even if they are ignorant and unlearned about what they are criticizing in others. The terrible thing is that most of these “monsters” are actually decent people who really do not understand the implications of what they are doing or the “faith” they are championing. They are basically good neighbors who want to do right and believe that they are doing so. Their leaders on the other hand often manipulate such people into believing that in thinking and even promoting evil, they are doing right. Thus otherwise good people become unquestioning servants of the real monsters, religious and political leaders that distort the Christian faith and use it to bludgeon those that they hate in the political and judicial process. The leaders of the Religious Right are a malignancy that will kill any authentic expression of the Christian faith if they have the chance. Their goal is no different than to what the leaders of the Islamic State aspire, but they wear better clothes and appear to be more socially respectable, if only because they are not yet allowed under American law to chop the heads off the people that they oppose. Knowing the history of Christians who controlled the state in past generations, I know that these people only await the chance to do this. It has happened all too often for any of us not to believe that it couldn’t happen again. That my friends may sound harsh, but it is all too true. Hannah Arendt spoke of the banality of evil by which she meant the people who just went along with evil without really thinking about or understanding the consequences of their actions which they in their hearts believe are right because their religion or ideology says so. But all too often, the people who absorb and adopt these views, who become “the willing executioners” of the policies of those that promote them are just as guilty, and just as responsible for their actions as if they had thought of them on their own. I choose to stand for Justice, truth and the value of a single human being over the doctrine of those that will use faith to depreciate, devalue and dehumanize those that they feel have departed from the truth. With that, I go back to my beer and on the game two of the National League Championship Series where I hope that my San Francisco Giants will win. I find Easter to be an interesting time. I tend to get reflective and while I do joyfully say “Alleluia! Christ is Risen!” I also tend to be somewhat subdued. By nature I am reflective person, I like to watch, observe and think. I am not into big Easter productions and extravaganzas. I prefer much more simple expressions of the Risen Lord. I think that Jesus would go along with me on this as he spent that first Easter walking with friends, who failed to recognize him, and then breaking bread, he celebrated the first Eucharist after the Resurrection at Emmaus. After that I went through kind of a spiritual desert as far as Easter was concerned. In seminary I was attending mega-churches which did nothing with Holy week, and made a big evangelical production of Easter, complete with overly loud and insipidly shallow “worship” music and laborious preaching. I have to say that these big productions were more of an ordeal than a celebration for me. During seminary we were going through sickness, financial disaster, loss of our home, cars and struggling to survive working multiple jobs while being a full time student. How we got through seminary I will never understand, other than that the Deity herself provided for us through a lot of wonderful people. The “happy talk” at church, the prosperity Gospel, focus on signs and wonders seemed to reflect almost a gnostic other worldly view of life that I did not see in the Scriptures. However, what Dr. Woodfin said planted a seed in me. This went from an academic question, to daily reality during my Clinical Pastoral Education Residency at Parkland hospital. Doing various Holy Week services there, in the midst of the amazing amount of pain, suffering and death in that gargantuan Medical Center brought into focus and made real what Dr. Woodfin said. At Parkland there was no avoiding death or suffering, and what Dr. Woodfin said was right. We don’t begin to do Christian theology until we we deal with suffering and death. Easter and the Resurrection don’t happen without the Incarnation and Passion of Jesus. Easter disconnected from the reality of suffering and death is nothing more than a “happy thought” or escape that avoids the the great Mystery of Faith: Christ has died. Christ is Risen. Christ will come again. After Parkland my understanding of Easter grew as I was immersed in the liturgy, began to observe the liturgical year, and occasionally “clandestinely” attend Anglican churches during Christmas and Easter. During this time Judy became Roman Catholic, something that accelerated what was already going on in me. During my formation process and following my ordination to first the Deaconate and then the Priesthood, the understanding deepened as I saw how the Gospel in Word and Sacrament. As an Army Reserve chaplain serving on active duty I experienced the life of a parish pastor at a small base in central Pennsylvania. There I saw how the how the liturgical year and life are so intimately connect. In life and death, in sorrow and joy, in good times and bad, the Holy Spirit touched people. 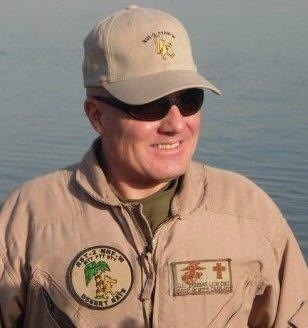 Easter became even more part of my life when I became a Navy Chaplain and left the Army in the “rear view mirror.” Here I began to see how wonderful Easter is when you do not have all the “smells and bells” “praise teams” or great music or facilities. It goes back to simplicity. On Easter Sunday 2001, I was on the USS Frederick, LST 1184 with my Marines going from Korea back to Okinawa. It was on Frederick 23 years before that I had first felt the call to be a Navy Chaplain during the trip to Pearl Harbor. In 2002 I was deployed on USS Hue City CG-66 at the beginning of Operation Enduring Freedom. Off the Horn of Africa we had both sunrise services as well as a morning Eucharist on our flight deck. While with the Marine Security Forces I spent an Easter celebrating Eucharist on the fence-line adjoining Communist Cuba. I now have come back to critical care hospital ministry in my ICUs. Here we live Good Friday every day. For me Easter is not just a nice thing to observe, but a necessity in life. This morning I attended the early Mass with Judy at Ascension Catholic Church. I love the church, though it is a bit big and busy for me now after Iraq. So I found me a corner near the choir where I could sit with my back against the wall, an emergency exit to my left, and where I could observe what was going on. Yes I was having a PTSD moment, but I got through it with the help of the Deity herself and a little ant-anxiety medication. But the really cool thing was seeing a man who was one of our patients on the ICU a couple of months back. A man who almost died on us several times, and his wife. We had grown close during that 2 1/2 weeks and he made it through. He looked great this morning. We all hugged and talked of how good God is before Mass, exchanged the Peace and then spent some time together after Mass. That was really cool. What a way to celebrate Easter. Life and death, pain and suffering, healing and resurrection. Alleluia, Christ is Risen. The Lord is Risen indeed. Alleluia!